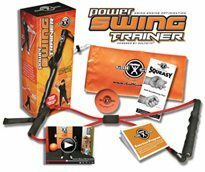 We received an anonymous comment on one of the previous posts which showed LPGA Pro Liz Janangelo performing a floor exercise to develop greater rotation. Anonymous said, "You should put a 65cm Orange Balance Ball under her legs for better support". That was a great observation but, Liz performing the exercise in that manner was on purpose and meant to add more resistance and really work her abs. Because you were so observant...we decided to show Coach Joey D performing three variations of the exercise in the manner on which you commented. 1. This first one is called "One Leg Over". 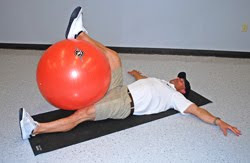 Start with the Balance Ball tucked tightly between the calf and hamstring of your right leg. 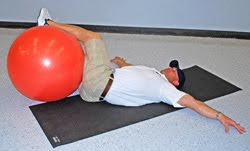 The other side of the ball should be resting on the inside of your quadricep muscle just above the knee. Keep your arms out to the side with your palms down. 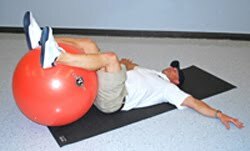 Drop your right leg as far to the right as possible to get a great stretch, then bring the ball as far over to your left as possible with your shoulders continuing to be in contact with the floor. Do 8 - 10 reps on each leg. Remember to breath in on the opening and breath out while rolling into the stretch. That will help you stay relaxed to go just a bit farther each rep.
2. The next one is called the 10-2 Roll. 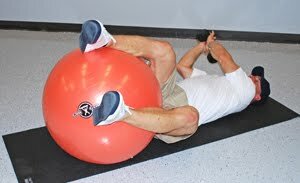 Lye on your back with your legs on the ball. Separate them to be at approximately 10 o'clock and 2 o'clock. 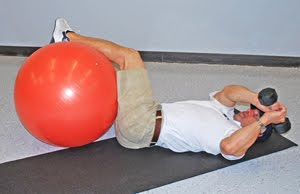 Try to keep the ball well tucked between your calf's and hamstrings. Keeping your shoulders and hands firmly on the floor, roll from side to side going as far as you can to get the most rotation possible. Repeat this roll 8 - 10 times to each side. 3. The final movement pattern is the variation which Anonymous requested. 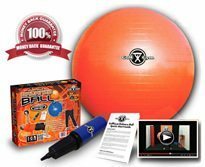 This requires a weight of 5 - 10 pounds depending on your individual strength. 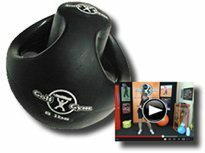 It is basically performed just like the 10 - 2 Roll except that you will be holding the weight in your hands and moving it in opposition to your legs. Build up to 10 reps on each side. 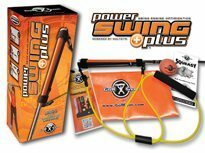 This one will really work your abs as well as your rotation. Give these a try to get flexible and strong at the same time. GolfGym congratulates Tom Pernice, Jr. on his 3rd place finish at the 2010 Posco E&C Songdo in South Korea on the Champions Tour. Tom is playing great this year and his fitness is a big component. 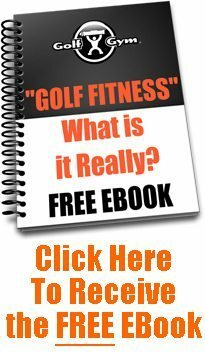 He is highlighted in Coach Joey D's book Fix Your Body, Fix Your Swing for a balance exercise that he performs regularly. Many amateur golfers can't even stand up straight on one foot for more than a few seconds. In the following pictures you see Tom in the PGA Tour Fitness Trailer not only balancing on one foot, but he is performing an entire movement pattern simulating a full golf swing. A key to performing this exercise well is to focus on one point on the floor while standing straight up on one leg with your hands hanging off to your sides. Then when you get comfortable in that position, start to lower yourself into a golf posture placing your hands in front of you simulating holding a club. 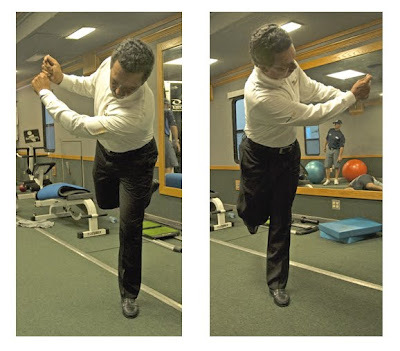 When you can go from straight to a golf posture several times, add the swing. I can tell you this, if you try to do the complete movement pattern right off the bat, you may be very frustrated. This exercise will not only challenge your balance, but work every stabilizing muscle in your lower body. Take your time with this and it will pay off for you. Oh, one more thing, do it on the other leg too! 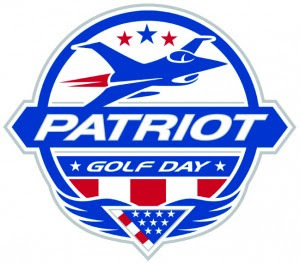 We at GolfGym ask all golfers to please go out and participate in Patriot Golf Day Weekend. Get in a round or two while donating to a very worthwhile cause. The explanation of Patriot Golf Day is below. Enjoy the game you love and feel great about helping the families of those of us who have sacrificed all they could to the security of our great nation. We wish you a great Labor Day weekend!